Rapper Jay-Z kicked off "Saturday Night Live's" new season as its musical guest, and paid homage to former NFL quarterback Colin Kaepernick during his performance. While performing "Bam" with Damian Marley, Jay-Z wore a black football jersey with Kaepernick's number, seven, and "Colin K" emblazoned on the back in white letters. Kaepernick protested the national anthem during the 2016 season. He said he was "not going to stand up to show pride in a flag for a country that oppresses black people and people of color." Jay-Z's jersey choice was a nod to the football player's decision to kneel during "The Star-Spangled Banner" last season, coming a week after President Donald Trump criticized the move. Trump criticized protests during the national anthem and called on NFL owners to fire any "son of a b----" who does not stand for the anthem. 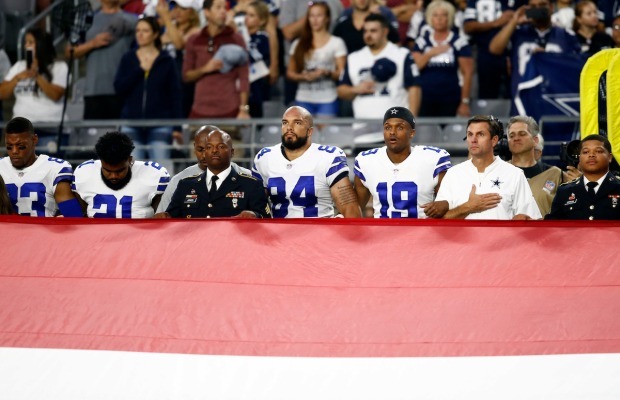 Trump's inflammatory remarks led to a league-wide response from players and owners last week.